Over 2.7 million Americans are living with glaucoma, according to the American Academy of Ophthalmology. However, with early detection and treatment, you can often protect your eyes against serious vision loss. But, what exactly is glaucoma, and how does the disease develop over time? The term, ‘glaucoma’, refers to not just one, but a group of eye conditions. These conditions damage the eye’s optic nerve and can lead to vision loss. 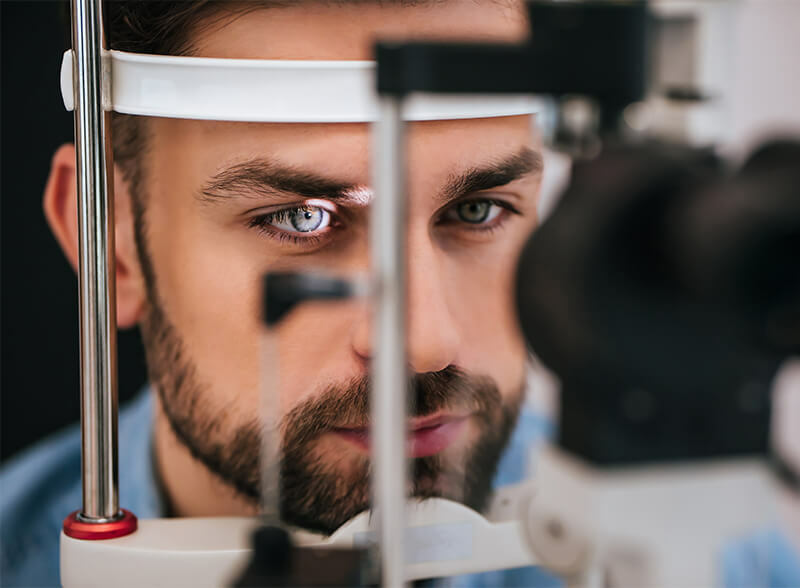 The good news is those routine eye exams, early detection, and treatment can help protect your eyes from further damage. Subsequently, glaucoma is often caused by high pressure within the eye or reduced blood flow to the optic nerve. Although, other factors may also play a role in the development of the disease, such as underlying medical conditions. Typically, vision loss due to glaucoma happens gradually over time. And, in many cases, you may not notice the symptoms until it’s reached the advanced stage. Still, there are some symptoms to look out for, although different types of glaucoma produce different symptoms. Some people report blind spots in their peripheral or central vision. While others recount severe headaches, eye pain, nausea, blurred vision, and eye redness. As with any other disease, certain groups are more at risk of developing glaucoma. For instance, glaucoma is most common in people over the age of 60. However, babies and children can also experience early-onset glaucoma. Glaucoma also tends to run in families and scientists have even discovered genes related to high eye pressure. In addition, the African-American, Asian and Hispanic populations are at a higher risk of developing the disease. And, certain medical conditions, like diabetes, heart disease, and high blood pressure, also increase your risk. While you can’t prevent glaucoma itself, you can take measures to prevent or slow down the progression of vision loss caused by the disease. Even if you have healthy vision, you should still have regular eye exams. Most adults require eye exams once every one to two years. Those over age 50 and with certain risk factors should see an eye doctor on an annual basis. During the eye exam, your eye doctor will conduct a glaucoma test. The most common test, tonometry, measures the inner eye pressure. You may know this as the “air puff test.” That’s because it uses a small puff of air to apply pressure to the eye. And, although there are other glaucoma tests, they usually aren’t necessary unless you fail the tonometry or show other signs. Then, if glaucoma is detected, the eye doctor may recommend a number of treatment options to help prevent vision loss. In most cases, prescription eye drops are used to treat glaucoma. Some oral medications are also effective at preventing further damage. Also, depending on the stage and type of glaucoma, laser treatment and surgery are viable options. At Looking Glass Optical, eye health is our number one priority. We use state-of-the-art equipment and techniques to perform comprehensive eye exams every day. So, if you’re due for an exam or would like to know more about glaucoma, request an appointment today. We’ll examine your eyes for common eye problems, prescription updates and more.